Supplier collaboration through standardized product qualification processes reduces cycle time and improves first-time yield. ISO 9001:2000 requires companies to take a proactive approach to this important process. The president of Baptist Hospital Inc. compares Baldrige with the organization's own quality programs. What's standing between your company and the $169 billion global market for medical devices? 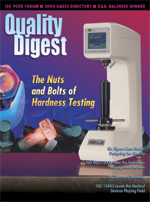 Find a gage to meet your measurement needs.